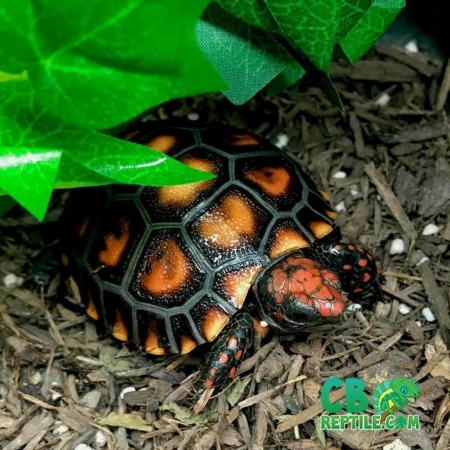 Red Foot tortoise information about proper red foot tortoise care including red foot tortoise diet, red foot tortoise habitat, red foot tortoise breeding and more. 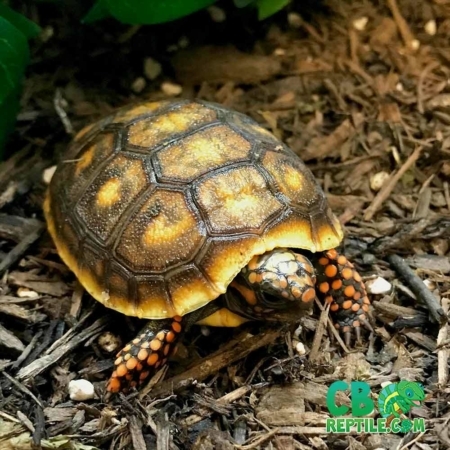 Before purchasing your new Red Foot tortoise for sale, be sure to find a reputable red foot tortoise breeder that works with ONLY CAPTIVE BRED red foot tortoises for sale as well as cherry head red foot tortoise for sale and yellow foot tortoises for sale. Red Footed tortoises are a moderately sized tortoise normally growing to around a foot long, though larger specimens have been reported. They are a tropical species and their care requirements are quite different to there meditaranian cousins! This caresheet is a basic guide to the care of Red Foot Tortoises, though any potential owner would be wise to purchase a more in depth book to ensure they have as much knowledge as possible on their care requirements before purchasing your tortoise. 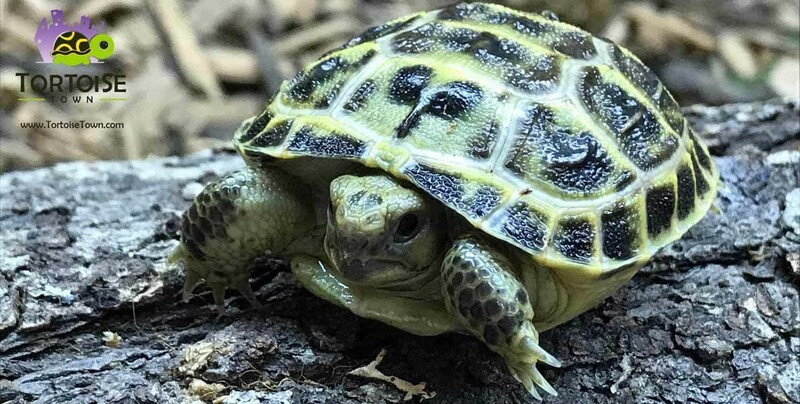 Whilst young Red Foot Tortoises can be kept in a heated Vivarium within a temperature range of 80F to 85F with a hot spot at 90F and a 10-15F drop at night. As the tortoise develops, it can be introduced to an outside pen but only during the warmer days of the summer and then brought inside during the night. 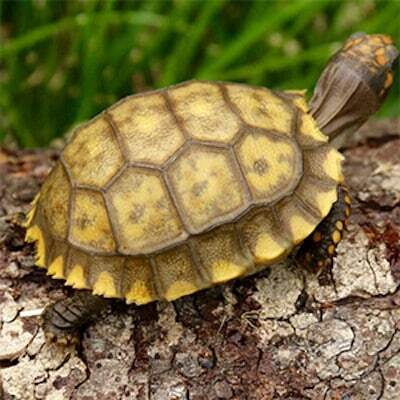 Whilst kept in a Vivarium, a deep substrate should be provided as tortoises commonly burrow. Whilst the tortoise is maintained in a Vivarium, it is vital that it receives the correct UVB lighting to aid vitamin D3 production and utilisation. In their native habitat little light reaches the forest floor so 5% UVB should be used. In the summer, when the temperature permits, the tortoises can be kept outside to benefit from natural sunlight. It is imperative that if you put your tortoise out in natural sunlight that you also provide it with a shaded area. This can be done either with a hide or with clumps of hay or grass. Being a rainforest species, Red Foots require a rather high humidity and so humidity levels in the vivarium should be maintained at around 70% – 90%. Too low a humidity can results in respiratory problems and inflammation around the eyes. Your tortoise will thrive on a diet consisting largely of fruit and leafy vegetables. Tomato, melon a grapes are suitable as well as carrot, and this can be mixed with various leafy green vegetables like Kale, Greens, Brussell Tops, Parsley and Watercress. Do not feed your tortoise Iceberg or Round Lettuce although you can provide “Mixed Lettuce” sold in supermarkets that consist of Chinese Lettuce, Raddico, etc. Lettuce should be viewed as once a week feed as it contains high amounts of water and not as much goodness as the other foods mentioned. Red Foot Tortoises are opportunistic feeders and in the wild they will also eat meat if it is available and so once a fortnight it is advisable to offer a low fat cat food to your tortoise to provide it with the animal proteins it would have in its natural diet. Because of the higher protein diet, it is even more important for fresh water to be available at all times and should be provided in a shallow dish, but deep enough so that your tortoise can submerge both its nose and mouth to drink. Be sure your Red Foot Tortoise can climb in and out of the bowl with ease. Check the tank daily for faeces and remove them immediately. Wash out the food and water dishes daily. Place your Red Foot Tortoise in an escape proof container while cleaning its enclosure. Both the tank and any washable floor coverings should be washed monthly in hot water and mild detergent. Use a Reptile Safe disinfectant to sterilise the tank such as BEA Reptile Disinfectant. Rinse well with hot water and dry thoroughly. On arrival soak you tortoise in tepid water in a cat litter tray or shallow bowl. Do not use cold tap water as this will be a shock to them. Soak them for approximately 30 minutes and then offer them fresh food. When you receive your tortoise it may have its eyes closed. They may have fallen asleep in transit. When you pick your tortoise up they should open their eyes within a few seconds. If your tortoise is sluggish in opening its eyes then bath them with clean tepid water. To ensure that your tortoise stays hydrated soak them every other day, as you did on arrival. You will notice that your tortoise will drink and then defecate. Leave them in the tray to soak for approximately 30 minutes. Clean the Vivarium completely at least once a week and remove droppings daily.